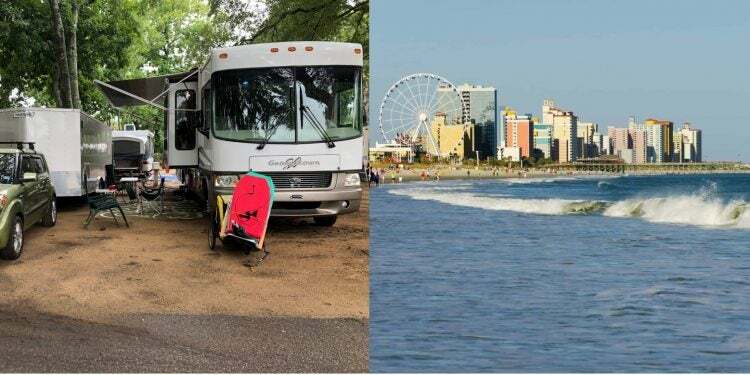 If you’re thinking of making a South Carolina camping trip, chances are you’re planning to visit the coast. 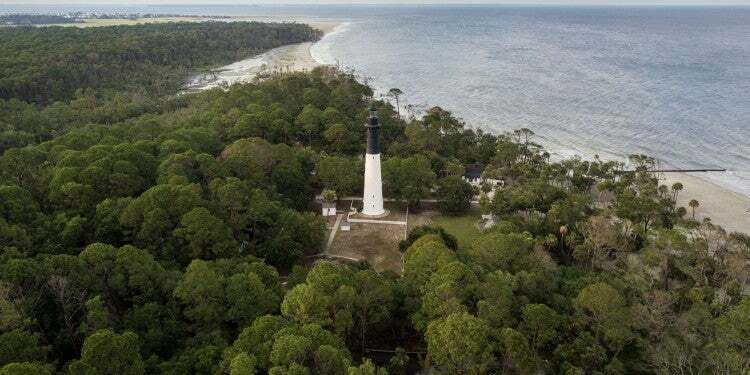 After all, The Palmetto State is known for its subtropical beaches, marsh-like sea islands, and historical coast cities. 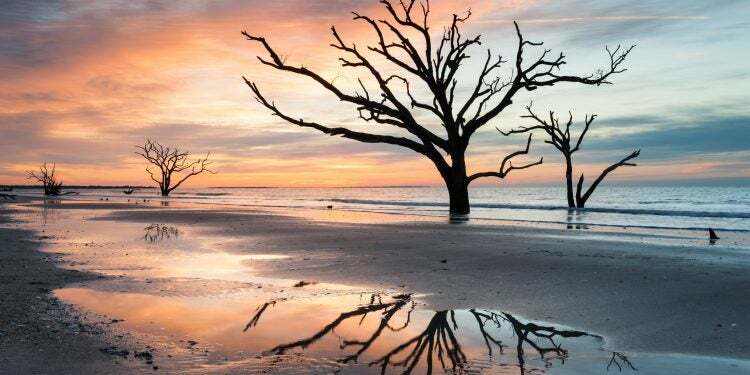 While the shore is definitely gorgeous and certainly worth a visit, if you limit your South Carolina travel to just this area, you’re sorely missing out on the rest of the state. 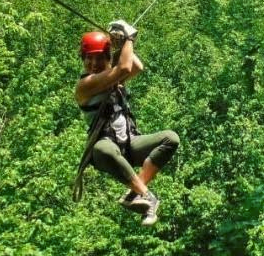 Heading away from the coast and upland, toward the Blue Ridge Mountains, you’ll find verdant forests, hills, and valleys, and steep cliff faces which lead to waterfalls across SC, some of the state’s best kept secrets. The abundant hiking trails in this area—along with choice camping options—are never far away. There are countless staggering waterfalls in SC with corresponding hikes of all levels that beg to be explored. We’ve collected reviews from real campers on The Dyrt, and created this list of South Carolina’s seven best waterfalls and where to camp nearby. Beginning this list is the tallest waterfall in the state of South Carolina, Raven Cliff Falls. The falls are a dramatic 400-foot cascade tucked into the Mountain Bridge Wilderness Area in the northwest corner of the state. The name of the falls comes from to the area’s raven population: they find the remoteness and seclusion of the high cliffs conducive to a safe breeding ground. In fact, over 150 species of ravens have been identified in this region alone. To reach these falls, you’ll hike a moderate 2.2 miles on the Raven Cliff Falls Trail; if you want to ascend to the top, follow The Gum Gap or Foothills Trail—both have stunning views of this South Carolina favorite. There are a few options when it comes to hiking and camping around Raven Cliff Falls. Jones Gap State Park is a favorite in this area among campers on The Dyrt, and is just over 5 miles away. 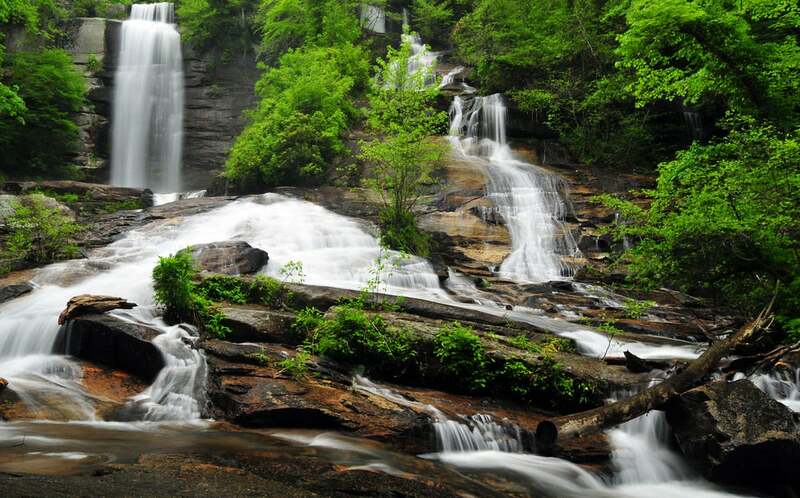 As a bonus to staying at Jones Gap State Park, campers can enjoy additional SC waterfalls within the state park. The nearby Falls Creek Falls is a jaw-dropping waterfall that consequently has some of the best trout fishing in the state. Tent sites in Jones Gap State Park are hike-in only, and do not have full amenities. There are 18 primitive sites, all of which are reached by hiking in. Costs range from $8-$20/night. For those that cannot hike but still want to enjoy the beauty of waterfalls in SC, Carrick Creek Falls doesn’t require any kind of strenuous hike to enjoy its beauty. Carrick Creek is a simple and serene smaller waterfall, and can be accessed by a short paved pathway that leading directly to the falls. It is entirely accessible by wheelchair, or for anyone interested in spying a gorgeous cascade in the Table Rock State Park area. Table Rock State Park, located along South Carolina’s scenic Highway 11, is a popular camping spot in South Carolina perhaps known best for its towering namesake mountain protruding from the surrounding Blue Ridge Mountains. The campground features plenty of area hikes, swimming, and outdoor recreation. There are tent and RV sites, as well as cabin rentals. For those who want to be near Carrick Creek Falls but are still looking for a more serious hike, Table Rock State Park has an access point to South Carolina’s 80-mile Foothills Trail. 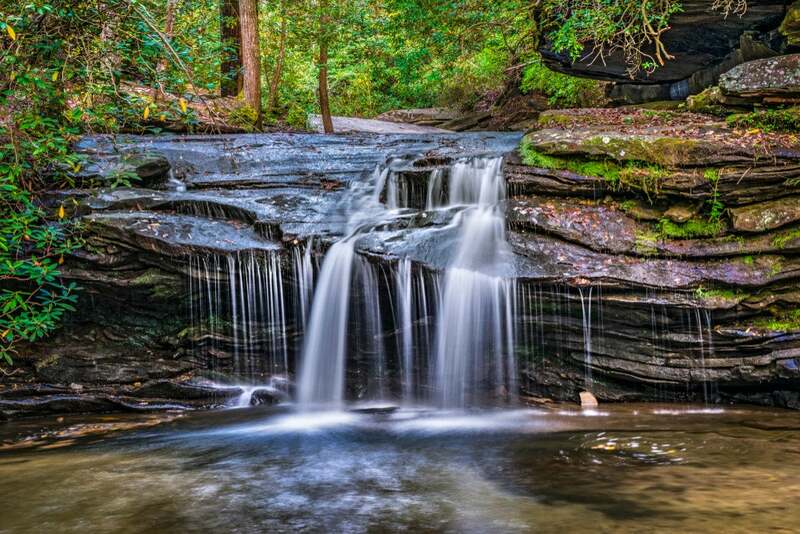 Located in the upstate Greenville County area, Moonshine Falls is a waterfall with a fun bit of history. The upper portion of the falls forms a large cave that still holds some impressive remains from the state’s moonshine production era. As a bonus, Confusion Falls sits a little less than a quarter mile downstream from Moonshine Falls, and is well worth the short hike. There are a few ways to reach these two falls; options range from easier to more difficult depending on the path. The easiest approach is from the Asbury Trail. The Asbury Trail can also bring hikers to Cascade Falls, a cascade waterfall with a fun swimming hole at its base. The other routes (The Pinnacle Pass Trail, The Natureland Trust Trail, and The Dismal Trail) vary in difficulty and length. For camping options near Moonshine Falls, the popular Caesars Head State Park offers pristine, yet rustic, primitive walk-up sites. There are 18 sites along the Mountain Bridge Wilderness Area trails. There is no water, electricity, or any other amenities. This is a backcountry camping experience, so come prepared. These sites range in price from $8-$20/night. Officially named the Greenville Wayside Park, Wildcat Wayside Falls is one of four waterfalls at this stop. It is one of the few wheelchair-accessible waterfalls in SC, meaning anyone can access but for those wishing for a bit more of a challenge, there is plenty of hiking nearby Caesars Head State Park. A heavy wet season gives campers the best views of the falls in this small park, as the creek all but dries up otherwise, and the water flow can be a bit pitiful. During a solid wet season, Wildcat Wayside is a stunning, simple waterfall with a pool for wading at its base. The Mountain Bridge Wilderness Area intersects the popular forest destinations of Caesars Head and Jones Gap State Park. The backdrop to this area is 13,000 acres of untouched southern mountainous forests, perfect for hikers, campers, anglers, and explorers. Campers can reserve sites along the Middle Saluda River within the Mountain Bridge Wilderness Area. Bring your fishing pole with you—the Middle Saluda offers some of the best trout fishing in the state. Campsites require at least a two-night minimum stay, and these sites are all hike-in only. Prices range from $22-$28/per night. There are grills/fire pit at each site, and all are pet-friendly. In a remote, thickly wooded section of the Sumter National Forest, the trail to Blue Hole Falls is a rewarding hike that leads to a beautiful 75-foot waterfall. The hike itself is more moderate, but the peaceful, quiet woodland you’ll hike through to reach the falls is what makes Blue Hole Falls special among the waterfalls in SC. After scrambling through a gorge and along the winding, slow-moving Cedar Creek, campers will find breathtaking views of the Blue Hole Falls as they plunge 75 feet. At the southern tip of the Blue Ridge Mountain Range, there are over 360,000 acres of pristine southern forest wilderness that make up the Sumter National Forest. 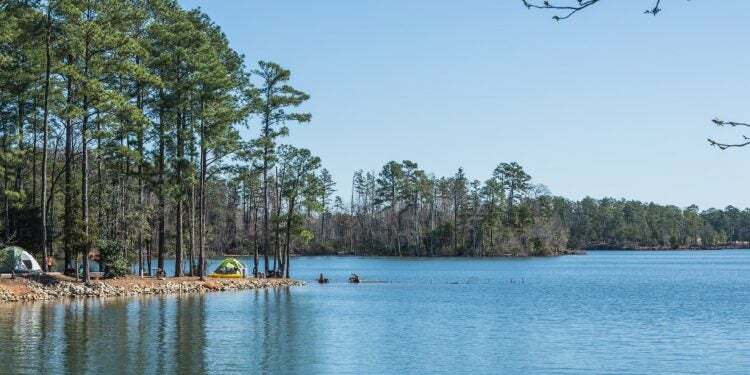 Offering scenic rivers, mountains, and wild forestland, this National Forest is a beloved area for outdoor recreational enthusiasts of South Carolina. The forest offers 22 designated campgrounds, ranging from rustic, hike-to sites to developed campgrounds with hot showers and drinking water. 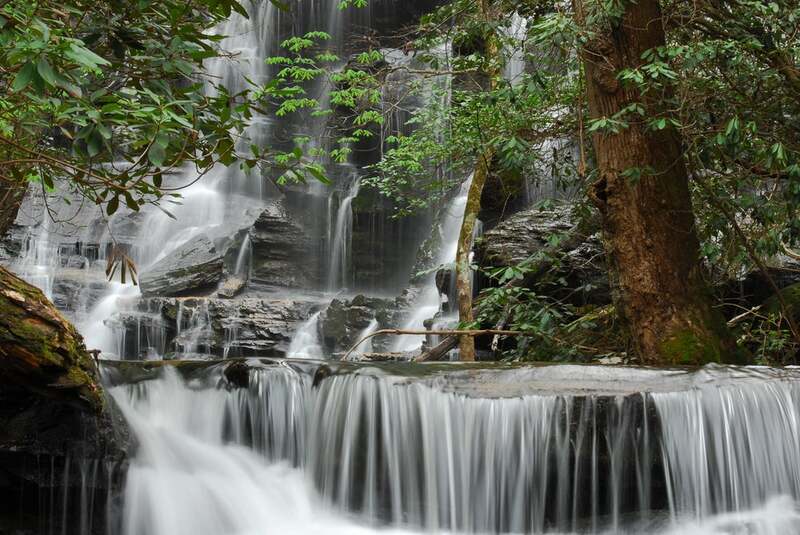 Twin Falls—also known by three other names, Reedy Cove Falls, Rock Falls, or Eastatoe Falls—is an easy hike that leads to a spectacular showing. After less than half a mile, this simple out-and-back trail leads you to an overlook point with a viewing deck. Falling 75 feet from a massive slab of granite, the Twin Falls themselves are a dramatic duo of waterfalls in SC. Tucked into the northwestern South Carolina’s Blue Ridge Mountains, the Keowee-Toxaway State Park is one of the states most stunning gem of a park. Lake Keowee is a pristine lake with excellent fishing, swimming, and other water recreation. The state park offers hiking trails appropriate for all levels, and acts as a gateway to the Jocassee Gorges. 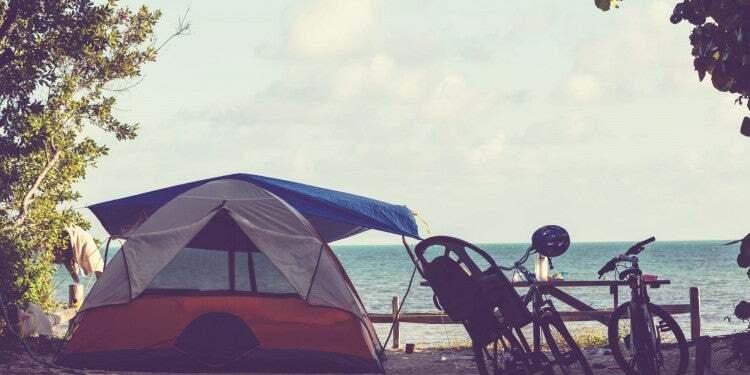 Campers with RVs—or those just looking for an easy drive in—will find 10 paved sites with water and electric hookups, accommodating RVs up to 40 feet. Tent campers can find a designated area with 14 sites, raised tent pads and fire rings. There are restroom facilities with hot showers. Most reservations require a two-night minimum stay, although one-night stays are permitted when made by directly contacting the park. Prices range from $22-$36/per night. The last location on our list of excellent waterfalls in SC is a true hidden gem—and a South Carolina favorite. Laurel Fork Falls is only accessible by boat or by hiking 16 miles round-trip. Is it worth it? Absolutely. Nestled into the gorgeous, lush South Carolina mountainside, this waterfall has great swimming, crystal clear waters, and because it’s a little more off the beaten path, isn’t typically as crowded as other, more easily accessible, waterfalls in SC. For access via hiking, the Foothills Trail is the best bet. 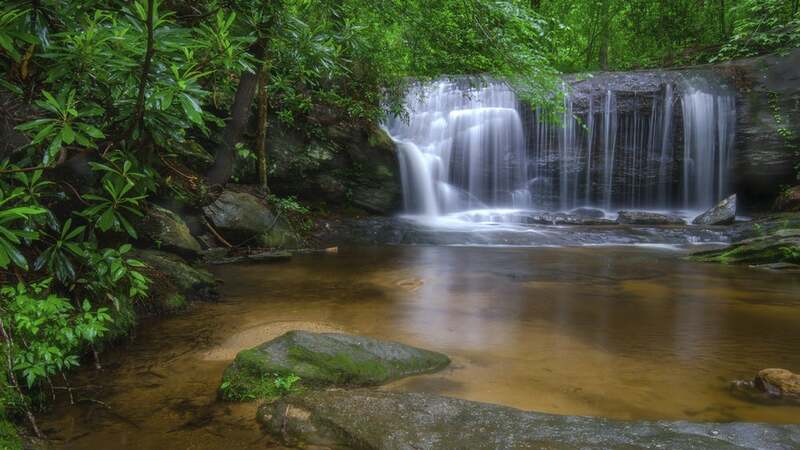 The hike rewards you with high ridge views, woodland bridges, and two stunning waterfalls—the Virginia Hawkins Falls as well as the Laurel Fork Falls. To reach Laurel Fork Falls by kayak or canoe, begin on Lake Jocassee and head into the Laurel Fork Creek finger of the lake. You’ll have a great view of a portion of the falls, and you’ll be able to swim and explore nearby. Although it only contains three designated sites, the small camping area off of the Foothills Trail for those looking to spend the night in the Laurel Fork Falls area. To get to the campsites and the falls by foot, plan on a 5-6 hour hiking trip. Come fully prepared with water, food, and backcountry camping needs.